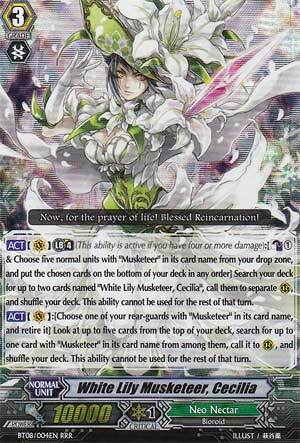 [ACT](VC) Limit Break 4 (This ability is active if you have four or more damage):[Counter Blast(1) & Choose five normal units with "Musketeer" in its card name from your drop zone, and put the chosen cards on the bottom of your deck in any order] Search your deck for up to two cards named "White Lily Musketeer, Cecilia", call them to separate (RC), and shuffle your deck. This ability cannot be used for the rest of that turn. [ACT](VC):[Choose one of your rear-guards with "Musketeer" in its card name, and retire it] Look at up to five cards from the top of your deck, search for up to one card with "Musketeer" in its card name from among them, call it to (RC), and shuffle your deck. This ability cannot be used for the rest of that turn. [ACT](VC) Limit Break 4 (This ability is active if you have four or more damage):[Counter Blast(1) & Choose five normal units with "Musketeer" in its card name from your drop zone, and put the chosen cards on the bottom of your deck in any order] Search your deck for up to two cards named "White Lily Musketeer, Cecilia", call them to separate (RC), and shuffle your deck. This ability cannot be used for the rest of that turn. [ACT](VC):[Choose one of your rear-guards with "Musketeer" in its card name, and retire it] Look at up to five cards from the top of your deck, search for up to one card with "Musketeer" in its card name from among them, call it to (RC), and shuffle your deck. This ability cannot be used for the rest of that turn. When I first saw these Musketeers, I really thought it was an interesting concept to be able to go through your deck at a relatively fast pace and mainly retain the triggers. Now that they are out, I honestly say that I'm glad that I chose the way of the Arboros Dragon; the legion of Musketeers really disappointed me as I personally see them as a smoke and mirrors deck especially seeing how they do not really hit for big columns by themselves. With that said, lets take a look at the queen of the Musketeers. For all of my Yu-Gi-Oh! people, stop me if you heard this one: you take five non-trigger Musketeers from your Drop Zone and put them into your deck. After that, you search for 2 Cecilia's and Superior Call them to the rear-guards. With this, this essentially gives you two 10,000 attackers AND adds more Musketeer targets back to your deck. With the new Cecilia's, you can either keep them for attackers or use them as sacrifice to call more Musketeers to the field. The downside to this is that with the extra Musketeers added to your deck, it essentially will decrease the chances of you Drive Checking a trigger. In conclusion, like I said earlier, as fast and flashy as the Musketeers are, they still lack the firepower needed to end the job at times. That and Cecilia is only 10,000, and like I have mentioned time and time before, being at 10,000 is starting to become a huge disadvantage. One of two limit breakers to be introduced to the Neo Nectar clan, Cecilia embodies the Neo Nectar theme perfectly: making copies. Her limit break is to call two more Cecilia out of the deck as rear guards as long as you are able to return five non-trigger musketeer units from your drop zone to the deck (and counterblast one card). Fortunately, this is entirely doable since much of the musketeer game plan is to retire one musketeer, then call another one, filling up the drop zone without costing you field presence. As a matter of fact, Cecilia herself has a once-per-turn skill that does just that. Also, being a musketeer herself, once the copies have been retired, they can be used as fuel to power the limit break, and called right back onto the field. Nice. Using Cecilia effectively requires devotion to the musketeer archetype; she is not a particularly splashable card. Most musketeer skills involve looking at the top four or five cards, and calling a musketeer that you find there. So, statistically, you probably want every third or fourth card in your deck to be a musketeer in order to ensure that you call something and don’t lose ground. This should mean that, by the time you ride Cecilia, you should have a few musketeers in the drop zone, and by the time your limit break is active, you are able to use it. Rating: 5/5 – In a musketeer deck, you WILL run this card.